The London Block Exchange(LBX) is a UK-based cryptocurrency exchange built to help consumers and institutions in London and across the United Kingdom to join the digital money revolution. The LBX is launching a Visa card, the Dragoncard, that will allow users to spend their bitcoin savings. The card, designed to overcome a key drawback of bitcoin that it is not a widely accepted form of payment, will convert holdings in bitcoin and other cryptocurrencies to pounds and allow users to conduct day-to-day transactions as though with a credit/debit card. When a user makes a transaction using the Dragoncard, LBX pays the merchant in pounds and withdraws cryptocurrency from the user's wallet and converts it into pounds. LBX charges a 0.5% fee for processing the payment. While there have been other companies to launch bitcoin cards, LBX is the first to introduce a card for all major cryptocurrencies. The exchange has been provisionally approved by the Financial Conduct Authority, the UK's financial regulator. The LBX wallet app provides real-time market data and allows users to exchange between cryptocurrencies. LBX has received £2m in funding for the project. Benjamin Dives, LBX's chief executive, spoke of the project, “Despite being the financial capital of the world, London is a difficult place for investors to enter and trade in the cryptocurrency market. While Visa has raised concerns regarding cryptocurrencies stating that regulations were unclear in the EU, LBX said it did not see such issues because conversions are only done in pounds. LBX launches in December 2017. If the project does go ahead without any regulatory intervention, this is a fantastic development for cryptocurrency users in UK. Being able to spend cryptocurrencies for everyday expenses is the ultimate holy grail for those who believe in cryptocurrency. 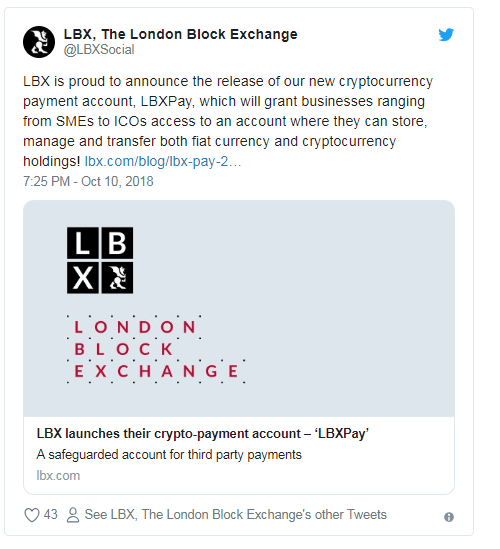 On October 10, the London Block Exchange (LBX) announced the launch of their new digital currency payment account called LBXPay. The role of LBXPay will be to act as a platform through which small enterprises and ICOs can store, manage and transfer both fiat money and digital assets. The traditional banking sector is opposed to the adoption of virtual currencies due to the perception that such assets are used to fund illicit activities such as money laundering. For this reason, individuals who wish to convert their crypto assets into fiat are often faced with problems, mainly because most institutions do not support cryptocurrencies. Moreover, enterprises have had to endure delayed payments, restriction of services and in severe cases, closure of accounts. The LBXPay platform is a solution to the challenges mentioned above. It allows businesses to freely engage in cryptocurrency transactions without worrying about adverse implications. Additionally, the account offers a convenient means of converting fiat currencies into crypto and vice versa. In addition, LBXPay enables its users to easily manage all balances, transactions and payments using the LBX app. Consumers who wish to transact in high amounts can do so on the LBX OTC trading desk. Furthermore, these wealthy investors will have access to an API linked to their LBXPay account as from early next year. Notably, all fiat holdings in LBXPay accounts will be stored in segregated banks accounts with a monthly statement and a designated IBAN. On the other hand, digital assets will be held in cold storage wallets. LBXPay account holders will be required to pay a monthly fee. This fee is payable in either GBP or LBXu, the native cryptocurrency of the London Block Exchange. Users who pay in LBXu will get substantial discounts. After the release of the enterprise version, LBX will make LBXPay available to retail investors. The London Block Exchange was introduced in November 2017 as an OTC trading platform. The company strictly adheres to KYC and AML regulations. Its users receive daily updates on market developments through the Telegram app or the LBX news channel. The London Block Exchange is the pioneering crypto exchange platform that exclusively serves the UK market. Its services are reliable, safe and simple, and are accessible through the web or via the mobile app. Currently, LBX supports 12 digital currencies and plans to add more in the future.